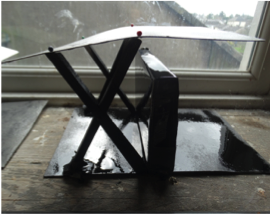 Using only a cardboard box the students have to transform a regular cardboard box into a load bearing stool. They may only use cutting implements and cannot use any adhesives or tape. 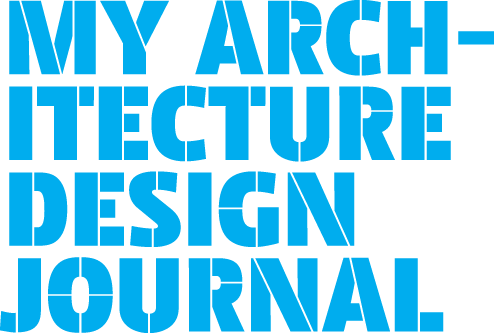 This first task is to get the students to draw their box using the language of architecture, this exercise introduces the students to initial basic architectural terms e.g. plan, section and elevation. 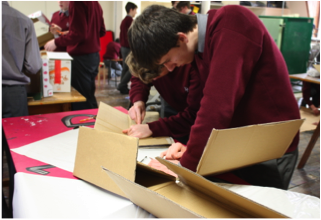 We also look at the elements of structure and loads and at methods to strengthen the cardboard e.g. folding and rolling. Working in groups of 3-4 students engage with the task at hand and are encouraged to troubleshoot any issues that arise. 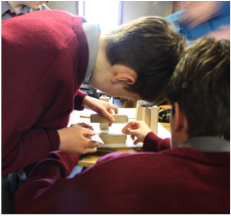 At the end of the session we have a group review where the students get to test their stool and see if they can withstand their weight. The students analyse the school and site at different scales; how do the students, teachers and staff interact with the school. They identify areas that are lacking, problems that could be improved or solutions to apparent issues. Using different colours they trace movements throughout the site and the school. 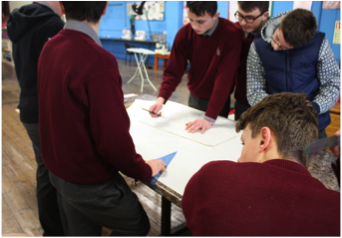 Once the students have identified problem areas they worked together in groups to create design solutions for sheltered social spaces internally and externally. 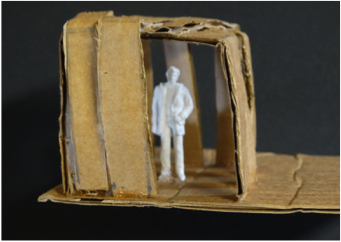 Through technical drawings, sketches and models the students crated design solutions for external shelters that could act as social spaces. They also created additional social seating areas for students in unused corridor space. 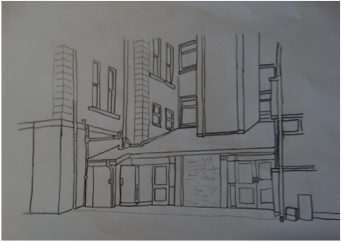 Site Visit: if possible a visit to a building in the local area can be beneficial. 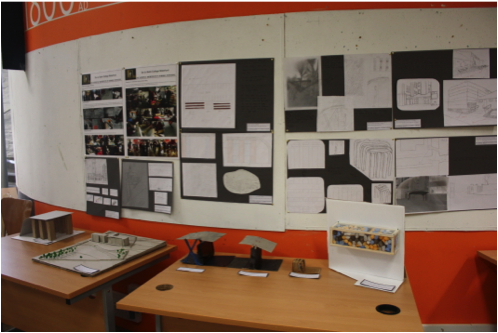 It introduces the students to architecture and can make them look at local areas differently. 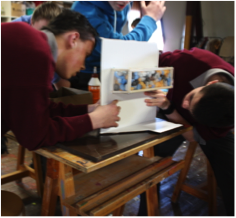 Working on projects within the context of the school creates a greater interest in the wider student body. Creating presentation boards that can be displayed within the school allows for better dissemination. How to’s: plans; For more technical drawings that analyse spaces use an everyday item as a unit of scale e.g. shoe for a small space or a human body for a larger space. How to’s: sketches; For some students sketching using photographs and a light box is a great way to overlay design ideas. 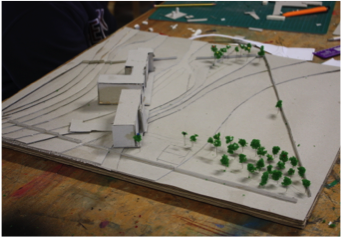 How to’s: concept model; As part of the initial investigation of the site the students made a 1:250 contour model of the school and the grounds. 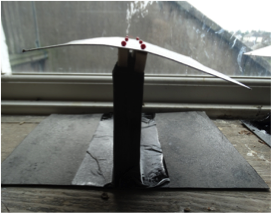 Students also made individual models of their design solutions for shelters. 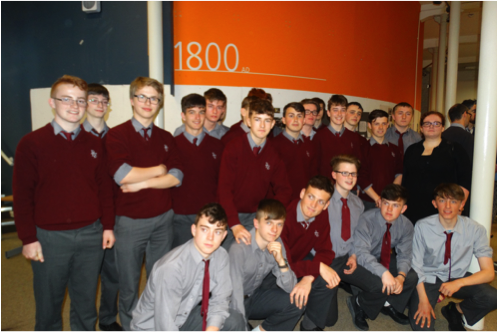 Well done to all the students at De La Salle Waterford and their architect, Emily Power!